Let's take a moment to look at satellite imagery of our country at night. There is only a glittering Javanese island, while the other islands are dark and only in the provincial capital alone show a bright spot. Why did it happen? Certainly due to the more developed or physical infrastructure and the much more populated population than other islands in Indonesia. It is estimated that more than half or about 60% of Indonesia's population is on the island of Java. The bright spots or glitter of these cities are indicators of physical progress in the area. Development can be highly developed in Java because the three pillars of the economy namely, capital, market and production can run quickly and efficiently. Inequality of development equalization must be immediately overcome, but how? The solution is to do the distribution of development through the three pillars of the economy above. Capital, markets and production must enter in islands outside Java with the same level of speed and efficiency. Acceleration can occur when a lot of business activities are done there. To run many business activities will also require a lot of manpower, so a more equitable distribution of the population is also needed. So what areas or business can be done outside Java so that in time also no less glitter when taken by satellite at night? With the vastness of overlaid areas, tropical climate and high rainfall, agroforestry-based industries are highly appropriate for these areas. Moreover, the era of bioeconomy has begun to appear in sight. Wood pellet production is one of the most suitable businesses for the current era, and it is important to draw the three pillars of the economy into those areas. The vast lands are used for energy plantations so that the production of wood pellets will sustainable. Especially with the condition of Indonesia now as a net importer of petroleum to meet domestic needs, the production of energy from renewable sources, especially biomass should get more attention. Even in Europe the energy from biomass gets a share of about 70% of total renewable energy. But with agroforestry still there is a less, the source of meat that is also very we need, as well as the source of fertilizer for trees (syajara) and plants (zar'a) them. So herein lies the beauty and completeness of His guidance, namely, He inserts the cattle that are grazed among the trees and the plants (Qur’an Surah 16:10). Cattle grazing is the most economical source of meat because it does not need human hard work to find or buy the feed. Livestock animals are also the most efficient source of fertilizer, because it does not require human labor to produce it, distribute it to fertilize it. So with agroforestry solutions plus grazing is the solution to increase the economic growth of 'dark areas' in our country. So with the integration with sheep farming, then food problems can also be gradually overcome. Consumption of meat low per capita of the Indonesian population, or according to the FAO, is only 1/4 of the world's population, namely, 10 kg /capita/year (average consumption of meat of the world population 40 kg /capita/ year) needs to be increased by boosting domestic production not even add by boosting imports of meat, whose prices are also increasingly unaffordable. The sheep will also be the best treasure, as well as the chain of saving the earth. 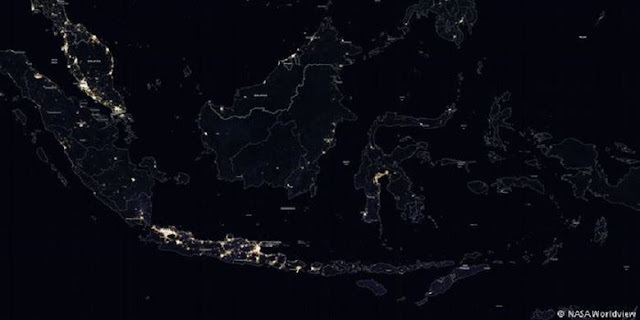 An interesting reference, we will find two countries of the same people, conditions and natural resources relatively the same, but at the night satellite imagery difference is strikingly different. 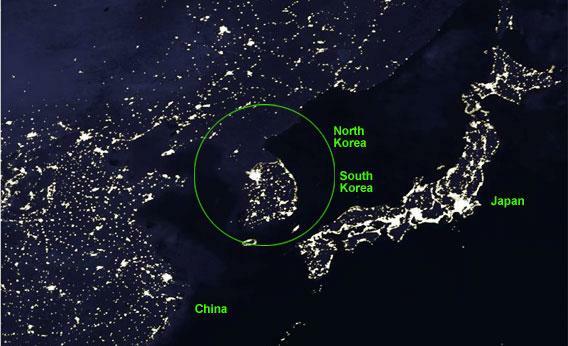 The two countries are North Korea and South Korea. Why did it happen? This is because three economic pillars in South Korea can flourish, while in North Korea led by the communist dictators' regime the three pillars are shut down, there is not even a market there because it is considered part of capitalism. What a fair leader's factor plays a role in the advancement of his people. South Korea seems not to be outdone by the glitter of Japan on its right and China to its left. In the Islamic government in Medina, the Prophet Muhammad even made the market so that the three pillars of the economy can run properly. With the market then the goods produced can be absorbed and by itself capital will flow in the activity. The Prophet’s market in Medina was even able to subvert the Jewish market in which many practices of cheating and underhand were practiced. Such a market should be created and run for both small markets and global markets so that economic justice can be realized. When the market becomes the locomotive of prosperity controlled by the ummah, then the subsequent prosperity wagons will be easily withdrawn ie the production of goods and services to meet the various needs of this ummah. When the market and production are controlled, then capital will come by itself. When economic justice can be realized then night satellite photos of countries in various corners of the globe will look sparkly. Insha Allah.